Caponata is a traditional Sicilian course. The recipes vary but should contain eggplant, celery and have a sweet and sourness. In some parts of Sicily seafood is included. The ingredients I used for this Caponata are all local products from the island of Pantelleria. Serve the Caponata as an antipasto with bread, or as a side course to go with fish or meat. The Caponata can be saved in the fridge for up to 7 days. Use a large pan pour some olive oil, and place on the heat. Add the aubergine chunks and oregano, season with a little salt and toss around so the aubergine is evenly coated by the oil. Cook on a high heat until the aubergines are golden, then add the onion, garlic and celery stalks and continue cooking for another couple of minutes. Add a more oil to the pan when it’s getting dry. Throw in the drained capers, olives, balsamic vinegar and sugar. Add the tomatoes and simmer for about 20 minutes or until its tender. At last stir in the toasted almonds.Taste and season if you need with more salt, pepper, vinegar or sugar. 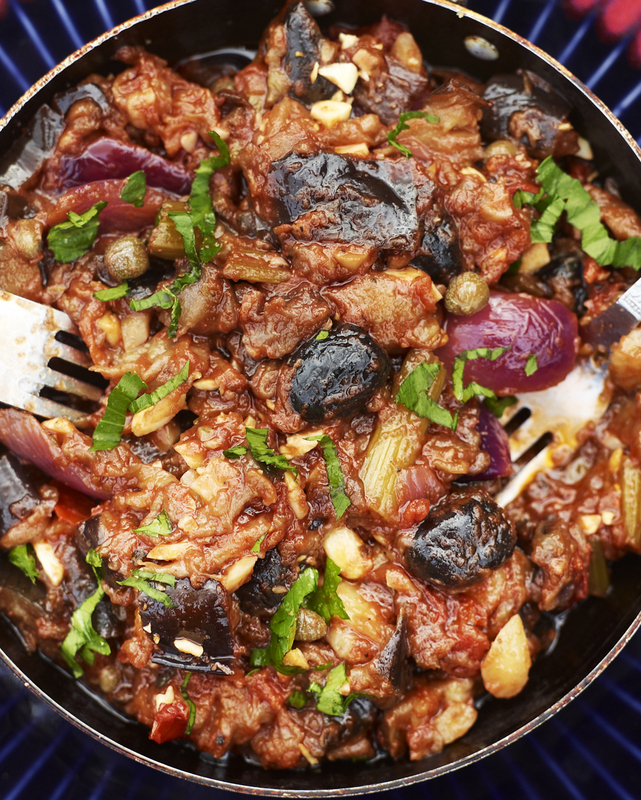 Serve the Caponata room temperature sprinkled with almonds and parsley. This entry was posted in Appetizer Recipes and tagged almonds, Anna Huerta, aubergine, Capers, caponata, Capperi di Pantelleria, eggplant, garlic, http://www.annahuerta.com/, olive oil, Olives, oregano di Pantelleria, Pantelleria, Sicily, Under the Almond Tree, vegetarian on November 8, 2012 by Anna Huerta.